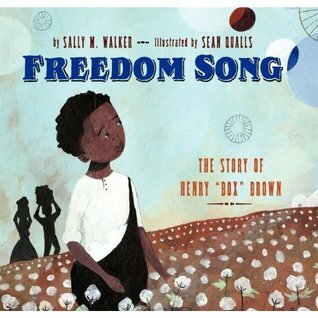 Freedom Song tells the true story of Henry "Box" Brown, a slave who mailed himself to freedom in 1849. This story is one of several that I shared each year with my fourth graders when they were studying American History, the Underground Railroad, and the lead-up to the Civil War. The basics of plot are well-known, and the story mountain, shown below, is one way of formulating them. The story begins with an introduction: we meet our characters and the general situation. Quickly, the problem sets the story in motion; the rising action or important events start piling up; and the climax brings us the big moment or turning point before the ending wraps up with a solution or lesson (denouement for the older students). This formulation of the story mountain is the one I use with my students. Freedom Song opens with the birth of Henry Brown and introduces his family. The first hints of the problem arrives at the end of the second spread: "The whole family's love grew Henry strong. Even though they were slaves on Master's plantation." The illustrations echo this pronouncement, as there is a small silhouette of the Master visible through the open window of the family's cozy-appearing home. The full problem does not arrive until several pages later. Now, through the rising action, Henry has grown, married, and is a proud papa of several children. A friend rushes into work to inform Henry that his wife and children have been sold by the master. Henry's solution, after much deliberation, is to mail himself to freedom in a shipping box. His journey within the box covers more than 9 pages (one single page and four two-page spreads) until we reach the dramatic climax - the lid is pried off the box, and Henry finds himself safely in Philadelphia. The ending is swift. Henry is free, but the Author's Note brings home the rest of the historical information. There is no evidence that Henry was able to find, free, or be reunited with his beloved wife and children. This book is a powerful one to share with kids. Every year, several of my fourth graders picked Henry's story to analyze for our literary essay unit, and each one was able to find incredible insights in this amazing true story. 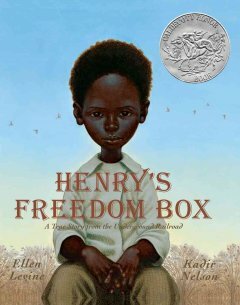 If you haven't read it, you should also check out the Caldecott Honor winning Henry's Freedom Box (2007) by Ellen Levine and illustrated by Kadir Nelson. Thank you for introducing me to the story of Henry's Freedom Box. I'm glad you share important topics with your students. Thanks, Manju. I find that these kind of stories - that focus on an individual - are often easier for kids to comprehend than those that more broadly address issues of slavery and history. What an incredible story! I'd never heard of either of those books, or of Henry. What an amazing way to think outside - or inside - the box to escape slavery! And what a great book to share with students. Thanks, Laura. It's an incredible story - especially when you realize that he was shipped by boat, and it took multiple days to get there! Henry's Freedom Box is at B&N in Asheville. I just read it while I was there last weekend. Loved it. The title made me think of a book I've been meaning to buy for a while now, Under the Freedom Tree. Perhaps I should break down and just finally get it. It's very poetic and lyrical. Not sure I know that one, Christie, but I have quite a round up of these kinds of books. Haven't read Freedom Song yet, but I have read Henry's Freedom Box. Can't tell from your bio where you are, but if you're anywhere near Cincinnati, or find yourself passing through, be sure you stop at the Freedom Center (museum). One of the displays is a box similar to the one Henry Brown stowed away in on his journey to freedom. Sounds awesome! I am in the Midwest but not likely near Cincy any time soon. I cannot imagine that journey. Just now catching up...and amazed we did the same story, Katie. I did Henry's Freedom Box and had it scheduled to come up Day 9. Then my daughters came for the weekend and I've been busy and not able to post or comment. When I saw your title on the linky list I didn't realize it was the same story. Same element. This was a great book and can't wait to read it to my granddaughter. Thanks for your review. Thanks, Damon. A great story, indeed! As I mentioned, I have been using Henry's Freedom Box for years with my students and was excited to discover this new take on the same tale. I knew this story but wasn't aware it was made into a picture book. What a great idea.